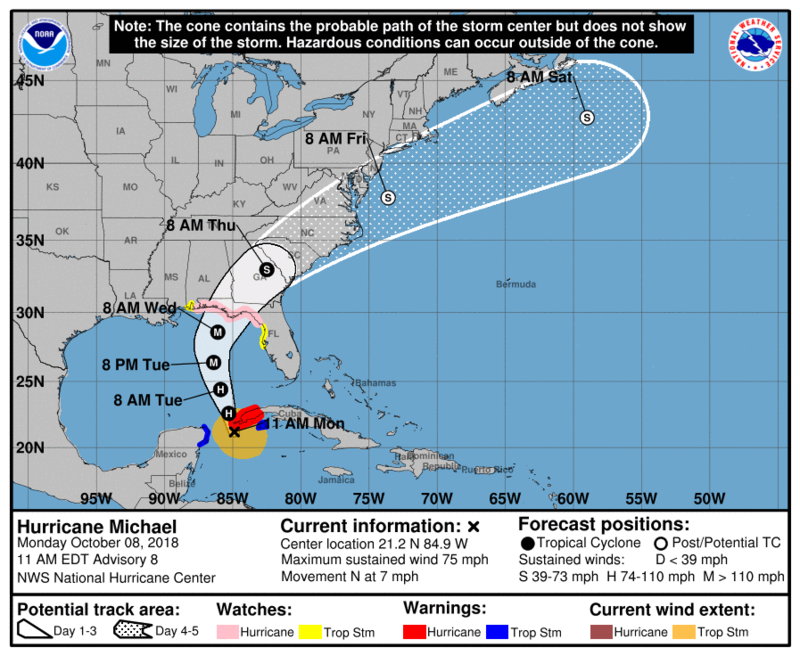 The National Hurricane Center has elevated Tropical Storm Michael to Hurricane Michael as it prepares to enter open waters of the Gulf of Mexico. Michael is forecast to be a dangerous major hurricane when it reaches the northeastern Gulf Coast on Wednesday, and life-threatening storm surge is possible along portions of the Florida Gulf Coast regardless of the storm’s exact track or intensity. Residents in the storm surge and hurricane watch areas should follow any advice given by local officials, as storm surge and hurricane warnings will likely be issued later Monday. 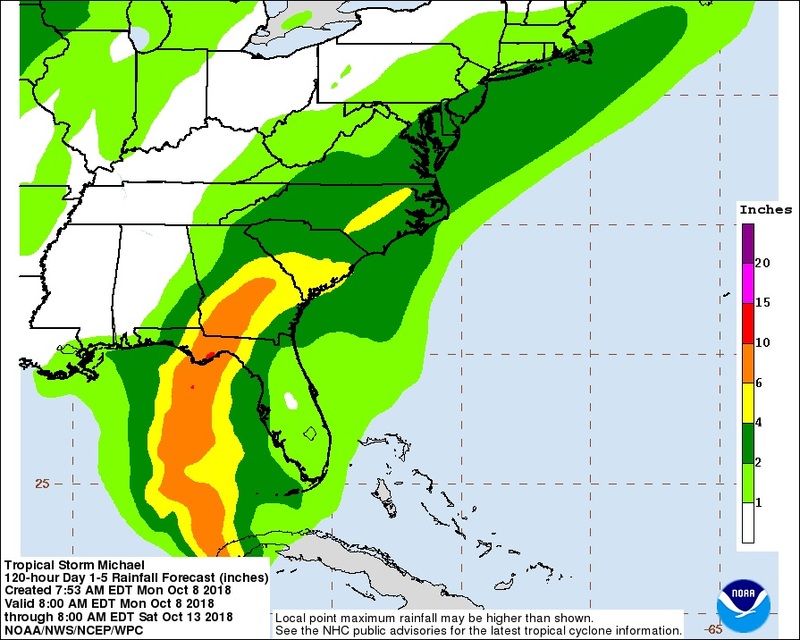 Heavy rainfall from Michael could produce life-threatening flash flooding from the Florida Panhandle and Big Bend region into portions of the Carolinas through Thursday. Hurricane conditions will spread over portions of western Cuba Monday afternoon, where a hurricane warning is in effect. Tropical storm conditions are expected over the northeastern Yucatan Peninsula and the Isle of Youth Monday. Michael is expected to produce heavy rainfall and flash flooding over portions of western Cuba and the northeastern Yucatan Peninsula of Mexico during the next couple of days. Michael now has maximum sustained winds at 75 mph, making it a Category 1 hurricane. Movement is to the north at 7 mph and the minimum central pressure is down to 982 mb. A hurricane warning is in effect for the Cuban province of Pinar del Rio. A tropical storm warning is in effect for the Cuban province of the Isle of Youth and the coast of Mexico from Tulum to Cabo Catoche, including Cozumel. A storm surge watch is in effect for Navarre, Florida, to Anna Maria Island, Florida, including Tampa Bay. A hurricane watch is in effect for the Alabama-Florida border to Suwannee River, Florida. A tropical storm watch is in effect for Suwannee River to Anna Maria Island, Florida, including Tampa Bay, along with from the Alabama-Florida border to the Mississippi-Alabama border. Steady to rapid strengthening is forecast during the next day or so, and Michael is forecast to become a major hurricane by Tuesday or Tuesday night. The forecast track at this point takes it to the Big Bend area of the Florida Panhandle and making landfall as a possible major hurricane late on Wednesday evening or early on Thursday (just after midnight). Rainfall amounts will be the highest along and east of the circulation center, bringing 6-10 inches of rain to the Florida Panhandle and up into the southern parts of Georgia. Parts of the Carolinas could see rainfall totals in the 4-6 inch range on Thursday and into Friday. The southeastern parts of Alabama will see 1-3 inches, with isolated totals approaching 4 inches. As far as weather for central Alabama with this forecast track, there should be aminimal effect from Michael throughout Wednesday and Thursday, bringing a few more clouds and a slight increase to rain chances. There will be scattered to numerous showers and storms on Wednesday and Thursday due to an approaching trough and associated cold front. 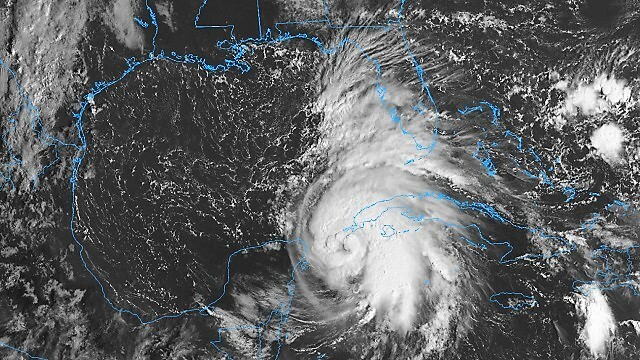 Alabama Power and Southern Nuclear officials are monitoring Hurricane Michael as it makes its move toward a Gulf Coast landfall and is prepared to deal with any effects on its systems. You can visit our “Hurricane Safety Tips” page or “Storm Safety” page to find tips and information as you prepare for Hurricane Michael landfall. For more from Scott Martin and the rest of the James Spann weather team, visit AlabamaWx.com.